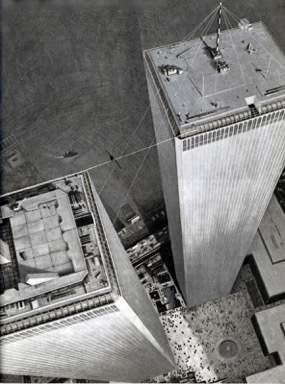 Philippe Petit during his infamous walk between the Twin Towers. 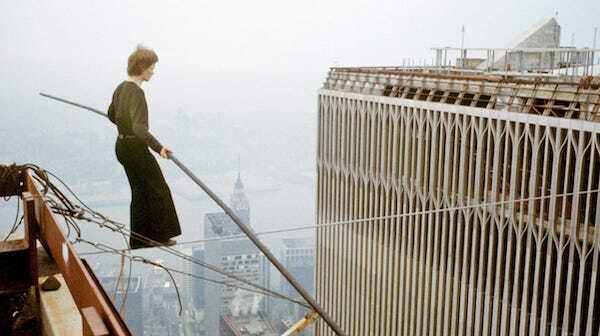 “If you’re not doing it — whatever ‘it’ is — as if your life depends on it, or you are about to lose it, you’re dead!” Philippe Petit tells me, with the conviction of someone extremely familiar with having his life on the line. The wirewalker, most well-known for his “unauthorized,” forty-five-minute-walk between the two towers of the World Trade Center, believes that ‘impossible” is simply a human invention. He’ll be coming to Guild Hall in East Hampton to tell his story June 22. After months of research, planning, impersonation, stealth and luck, they succeeded after many tries to shoot the 440-pound cable from one rooftop to the other with a crossbow, secure it, and set it up for the greatest high-wire walk ever attempted. In the heat of August, Petit made eight passes across his wire, 1,000 feet in the air without a net — walking, jumping, kneeling, and even lying down — for a stupefied audience of chance New Yorkers on the ground, before the police handcuffed him and took him down. And yet, because of an internal safety net he has developed in his mind, along with his somewhat obsessively detailed preparations, he claims he is not a risk taker. He doesn’t actually believe that it is possible for him to fall. He told me he saw the towers as two faces turned away from one another, and, unless he linked them with his wire, they would remain separate. “It’s amazing that they weren’t even built when I got my idea. It was so childlike. The towers were just a dream,” he says. In choosing his locations for his unauthorized, and now authorized walks, the “poetics of empty space” motivates him. Mr. Petit is still an artist-in-residence at the cathedral. “Walking the Harp/A Bridge for Peace”, was a high-wire performance commissioned by former Jerusalem mayor Teddy Kollek, performed on an inclined cable linking the Jewish and Arab quarters, to help bridge a gap in that community. Mr. Petit intended to throw a dove into the air as a symbol of peace, but the dove was uncooperative, landing on his head, on his wire, and finally at the end of his balancing pole. No one on the ground could imagine how he had trained the dove to do that. When I heard that Mr. Petit, who hails from France, had lately built a barn in the Catskills using only 18th Century tools, I thought it was a perfect coincidence to record my telephone interview with him, for sound reasons, inside my 18th Century French armoire. “I live in the 18th Century!” Mr. Petit told me, a self-proclaimed Luddite who “can’t live in the 21st Century,” because, even though he speaks six languages, he simply cannot learn the computer language. I climbed into my cabinet, but quickly realized that none of my recording systems were working. Flustered and taking furious notes in the near dark with my phone in my other hand, it was some time before I realized I had never gotten out of the wardrobe! Mr. Petit reveres discipline and has spent his life intently mastering the details of his passions — he’s been a street juggler, pickpocket, toreador’s apprentice, wire walker, author, fine artist, builder, public speaker and teacher, among other things — but he also recognizes that creativity is a wild thing, with its roots in chaos. 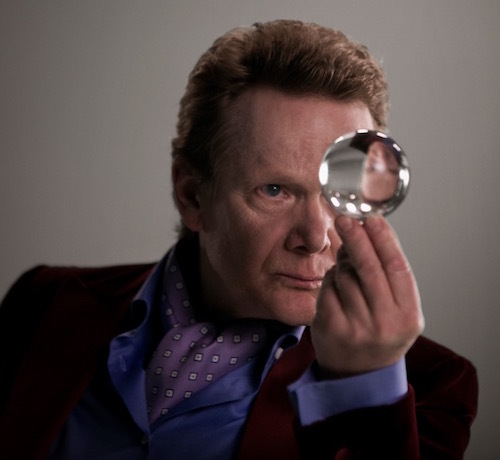 He advised me there should be no preconceived notions of his giving a rehearsed lecture or wire performance of any kind for his “Stories From The Sky: An Evening With Philipe Petit” at Guild Hall on June 22. These are Stories From The Sky. It’s improvised, down to earth,” he said. Reenactment, improvisation and inspiration will be the Gods of the moment. 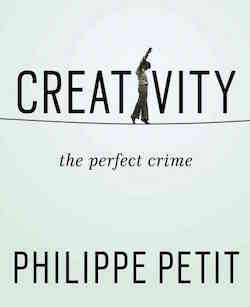 One of the gifts Mr. Petit offers is shocking us — looking up at him walking through the air, time is stopped — and shifting us, with his magic, out of our perspectives and habitual notions of what is possible. If he elicits this in his onlookers, I wonder what we elicit in him. He says there is a feeling of great power in his position in the air, but not in an egocentric sense. “If I think of my ego up there, that’s death. I have to think only of balance. I have a curiosity for exploring the netherland, a passion,” he says. “It’s the same on a ten foot wire or 1,300 feet high. In the photographs from his Twin Towers walk, his face is ecstatic, joyous, beatific, like ancient religious paintings of angels and the Virgin. I wondered if he knew what he was radiating. Early on, Mr. Petit rebelled against authority, especially his upbringing in a middle class home in France. By the age of five, he was terrifying his mother, climbing everything he could, happily spending most of his time in his own company, and “following my own ways of thinking.” That is the grounds from which his genius sprang: his rebellious nature and having endless solitary hours to practice his first card tricks and juggling acts. He laughed when I asked him about his first successful pickpocket experience, because for him it was all about “the magic ballet of the fingers.” Since he didn’t fancy going to jail, he would pick pockets and then return the items to their owners. “It’s my reaction to being a perfectionist,” he told me. Because he is obsessed with details, he feels the need to go completely in the other direction. So he puts all possibilities down on paper, everything that might go wrong, or right, anything and everything that comes into his mind. When it is all down, he takes it out and surveys the disorder. “It’s truly the way I think — first chaos, then the edit!” he says. To the same degree that he learned to distrust others in his formative years, he learned to trust his materials. He respects and salutes them. At the end of a Ted Talk, he specifically thanked his juggling balls, after thanking the audience. Mr. Petit believes his unique relationships and fascination with his props comes from being self-taught. The materials are his collaborators, beings that are alive and that must be loved and communed with in order for his magic to succeed. Since the cable he uses for his walks is much stronger than a human being, and can throw the walker off —it sways in the wind, bounces and reverberates with the slightest pressure — every moment on the wire is a joint venture. It is only by being in relationship to the aliveness of the wire that he can make magic. One of his specialties early on was walking the wire without a pole while juggling. The balancing pole he does use is one that he designed, and is really an extension of his arms, he explained. Since the poles weigh as much as forty pounds, most performers tie it to their waists or tether it somehow, because it’s too heavy to carry, but he won’t. Mr. Petit tells me there was no love lost between him and his father growing up. He was asked to leave his family home when he was 17, but he now understands that his father must have inspired him without his being aware. Since Philippe is not only a performer, but has lectured, written 10 books, and developed fine art drawings, he believes his father’s talents must have influenced him. Even in Mr. Petit’s perhaps more mundane-seeming occupation as a builder, there is magic involved. When it was time to raise the parts of the barn he built in the Catskills, he invited 50 friends to help, and they brought lots of children. Mr. Petit attached ropes to the framing so that when the order was given, all would pull the segments into place. He made ropes for the children that had tension, but were not weight-bearing, so when the call was given and they said heave ho, the kids felt the magic of raising the barn as well. Even though what he did might look similar, he reminded me again, he wasn’t like other circus performers. He wasn’t death-defying up on the wire, he was “carrying his life across the wire,” which was the essence he carried through into all of his work — his books, lectures, drawings — his life was on the line. In everything, he acts as if his life depends on it. Philippe Petit’s “Stories From The Sky” will be at Guild Hall in East Hampton on Friday, June 22 at 8 p.m. Tickets range from $28 to $75 and are available online at guildhall.org or by phone at 631.324.4050.